Kim and I were friends before I began Sister Birth, having been introduced by a mutual friend and sharing some common interests. I was so excited when she got pregnant for her 4th and decided that this time she would have a home birth. And I was pleasantly surprised when she contacted me 30-some weeks into her pregnancy to ask if I'd put on the Sister Birth hat and walk through this pregnancy and birth with her and her family. Of course! For Kim, prenatal appointments didn't require much in the way of information or education since this wasn't her first rodeo. The home birth part was new, so there were some things to talk about regarding preparations for that. And she had a bit of a health scare at about 35 weeks, too, which definitely held us in suspense and wondering, needing to learn to surrender to outcomes that might not be what she hoped for. Luckily, it all resolved and she got to have her dream birth. But for Kim, her top priority was having another person present at the birth to help with kids, to support and fetch and do things behind the scenes so that it wasn't all on her husband. And to take photographs, of course! 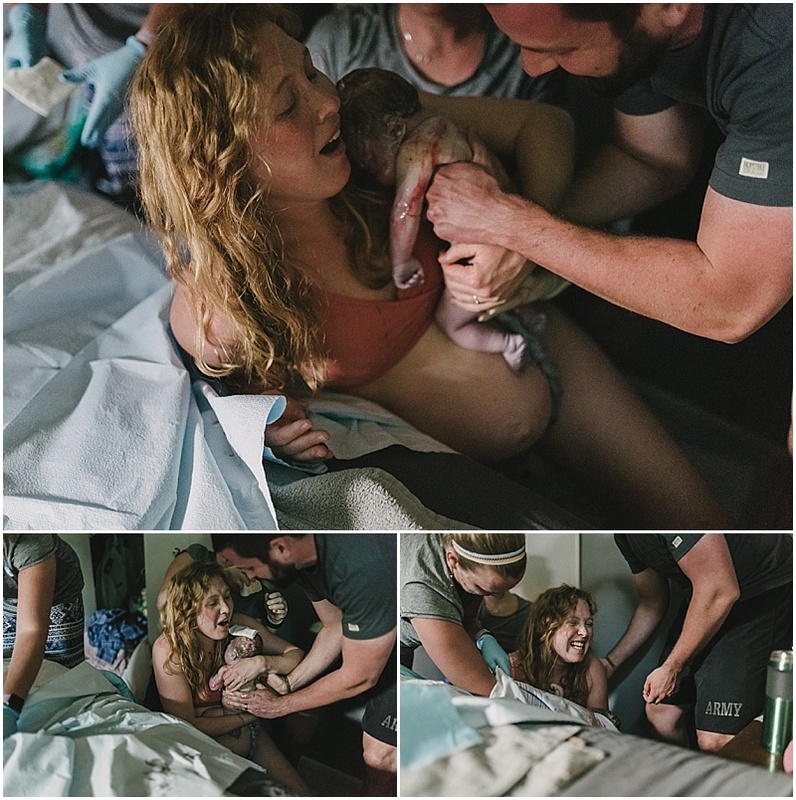 She'd always wanted birth photography but hadn't allowed herself the indulgence until now. This baby came past her guess date. Kim was pretty patient, even so. And when labor DID start, it was quite quick. I arrived to find Kim in her birth pool, already deep in labor land, with her husband totally entrained and in a great flow with her, offering quiet, strong support. I fetched water and cool washcloths, used encouraging words, listened for the kids, and took photos. The kids were all still asleep, as it wasn't quite dawn yet, and her midwives were circled quietly around in various corners of her large bedroom, readying equipment, charting, and just holding space. It was so peaceful. Eventually the sun began to rise and light spilled in the windows, and one of their older children woke. I helped her get breakfast and alternated between keeping her company and staying in the birth space. Baby was born in the thin space between bed and closet door, not long after sunrise. Kim's husband helped receive her and pass her up to Kim. And this I will never forget: Kim's radiant, triumphant smile as she said over and over again, "yes! yes! yes! I did it!" I captured some photos then ran down to check on the awake child and help the next one to wake out with her breakfast also. Eventually the children came into the room, too, to meet their baby sister while Kim delivered her placenta. I made breakfast for Kim and a placenta smoothie, taking photos all along the way, of course (always). It was a room full of oxytocin and triumph. And because this is long enough already, I'll save the postpartum photos and thoughts for a separate post very soon. Thanks for reading along. This was an amazing journey to be on with Kim and her family. I'm so so grateful.